Columnist Charly fights the fight for free SSL certificates with Let's Encrypt. He particularly likes the matching software client that takes care of everything – from certificate retrieval to web server integration. Although more and more web servers now use TLS, small businesses and amateur users are worried about the administrative overhead that accompanies SSL certificates. The Electronic Frontier Foundation, the University of Michigan, and the Mozilla foundation helped launch a project that addresses two pain points. For one thing, it distributes Let's Encrypt  SSL certificates free of charge. For another – and this is where the project scores points compared with other free offerings – it delivers a Python client software tool that autonomously takes care of creating, validating, signing, and renewing certificates in good time. It even helps administrators integrate certificates with services running on their servers. Here certonly creates a certificate but does not automatically integrate it with the web server configuration. I prefer to do this myself; after all, this part of the software is still beta and only works correctly for Apache installations that have not had their configuration manipulated by admins. The --standalone parameter starts a web server for validation purposes – this is one of the reasons the tool needs root privileges. Next, letsencrypt-auto briefly stops the active web server; the server is only allowed to continue doing whatever it was doing after passing the SSL checks. The certificates generated here – cert.pem, chain.pem, and fullchain.pem, which combines the previous two, and the private key privkey.pem – end up in the /etc/letsencrypt/live/<mydomain>.com/ directory. To integrate this with an Apache web server, I need to pay attention to the Apache version number. Listing 1 shows the required instructions. 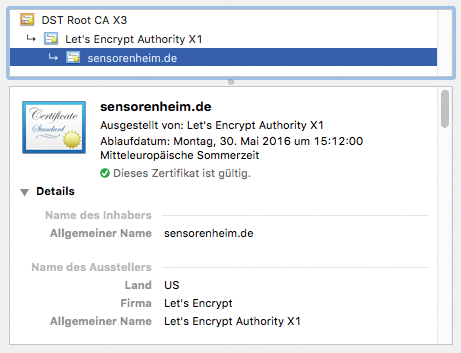 To renew the certificates, which are only valid for 90 days (Figure 1), automatically, you can simply run letsencrypt-auto with the renew parameter within this period. Figure 1: The browser reporting that the Let's Encrypt certificate is perfectly okay, but it expires May 30.